Enjoying a good book is always a treat. Having a treat along with your reading is even better. This Autumn, I’m hosting a mystery book discussion series, “A Taste of Murder,” at my Library. It’s an opportunity to read culinary murder mysteries and sample delectable treats! After all, isn’t the image of reading a book by a cozy fire while enjoying that hot chocolate or glass of wine ingrained in all of us? And I invite readers of The Poisoned Martini to join me–at least online that is. Share your love of mysteries. Comment on this post with some of your favorite mystery authors. Participate in the Character vs. Plot poll on this site. And join me in reading the books in the “A Taste of Murder” series. 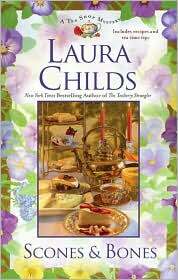 For September, read Scones & Bones, the latest in the Tea Shop Mystery Series by Laura Childs. Theodosia and company are on the hunt to solve the theft of a valuable skull and the murder of a museum intern, both of which occurred during the Heritage Society’s Pirates and Plunder show. Or share your thoughts on any of the Tea Shop mysteries. Just be sure to enjoy a cup of tea along with your reading endeavor. In October, The Chocolholic Mysteries by JoAnna Carl will be featured. These culinary mysteries feature former Texas beauty queen Lee McKinney, who serves as the business manager for the Michigan resort TenHuis Chocolade, owned by her Aunt Nettie. Read any book in this series and share your thoughts. Try some chocolate along with your selection. 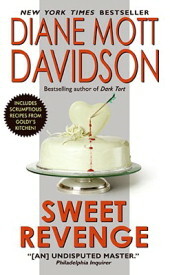 November brings Sweet Revenge by Diane Mott Davidson. In this 2007 entry in the Culinary Mystery series, Goldy Schultz thinks she’s seen a ghost. Sandee Brisbane is supposed to be dead, but Goldy keeps seeing a woman resembling her. When a former district attorney is found dead in the library, Goldy is determined to get to the bottom of it all. I’ve decided to have a selection of gourmet cheese and crackers for this one, but kudos to anyone who tries one of Davidson’s delectable recipes included in her book(s). Finally, in December, it’s time for gingerbread. 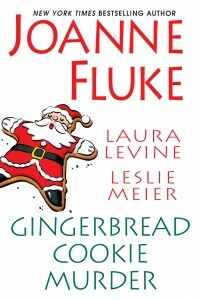 Read Gingerbread Cookie Murder, a trio of novellas by authors Joanne Fluke, Laura Levine, and Leslie Meier. In this holiday collection, gingerbread cookies feature as clues in murder. Here’s a great opportunity to sample three culinary mystery authors at once! And I highly recommend noshing on gingerbread cookies, maybe with some eggnog, while enjoying these. The reviews for these selections should appear around mid-month on The Poisoned Martini. Look for them and share your thoughts on these delicious reads!